Ever wanted a completely custom bike build? Or even to customise your current bike? Custom built bikes will always far exceed standard off the rack bikes as we can control everything down to the finest detail to maximise comfort, fit, and handling, and improve upon all elements of cycling for the rider. It could be less expensive than you think. For a quote simply email info@360cycles.ie with a rough or detailed description of what you would like, including your goals or style of cycling, a list of any particular parts you really want, and a rough budget if you have one. We will reply to with an estimate/quote. This cockpit setup weighs only 700g. Along with multiple armrest width and fore-aft positions, the telescoping extensions can be adjusted for length and 3T offers different extension shapes to suit rider preferences and governing body guidelines. 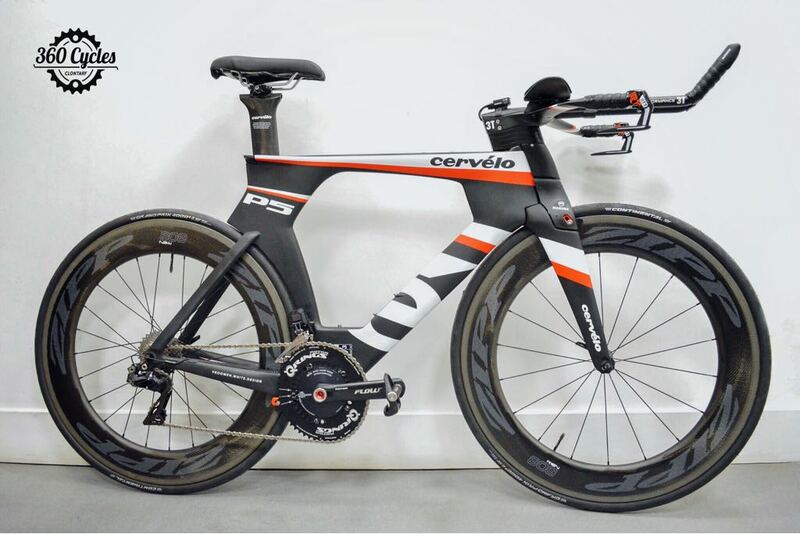 Magura, in collaboration with Cervélo, has developed a fully hydraulic rim brake system called RT8 TT that is specifically designed for this frame and has proved to be a game changer in the time trial and triathlon world. This was the obvious choice for performance, aerodynamics and aesthetics. With Firecrest’s unparalleled approach to the wheel’s center of pressure, the 808 Firecrest Carbon Clincher also handles crosswinds with the stability you’d normally associate with a much shallower rim – making the 808 Firecrest Carbon Clincher ideal for non-disc-legal courses like Kona. Plus, the wide rim shape provides efficient power transfer along with comfort and durability, making it an excellent choice for just about any terrain and riding style. At the center of the 808 Firecrest Carbon Clincher is Zipp’s 77/177 hubset with best-in-class durability and improved bearing protection with no pre-load adjustment needed. The result is improved stiffness, durability, simplicity and versatility. We paired the Zipps with a pair of Continental GP4000S II, which have a Vectran breaker for unsurpassed puncture protection and Continental's advanced BlackChili compound for lower rolling resistance and increased grip. This tyre rolls fast and gives superior grip and reliability on our rough Irish roads. We wanted to maximise comfort while keeping good inner leg clearance during pedalling so after some testing on the rider we decided to try the ISM PN 2.1. This saddle features the same 40-series foam and gel padding as the PN 1.1 but features custom laser-etched graphics, upgrade chromoly rails, and a rear transition hook for easy racking and storage. The rear width is a narrow 120mm wide for excellent thigh and hamstring clearance. The PN 2.1 is nose-less and designed to remove pressure from soft tissue, ensuring maximum blood flow and providing a healthier and more enjoyable ride. This is an extremely aerodynamic and stiff chainset which is CNC machined from high grade 7055 aluminium to reduce weight. Q-Rings can improve your performance, minimise fatigue, and reduce stress on the knee, which had been a problem area for the rider previously. They also virtually decrease the gear ratio in the dead spot and increase the gear ratio in the power phase where the rider exerts the most force. All of these small gains can add up to a lot over an entire Ironman from just 2 components, which are normally overlooked by most riders. Shimano have designed a beautiful groupset in the Dura Ace Di2 range. They give crisp, reliable functionality while maximising performance and shifting under pressure, and even reduce energy exerted by the rider when shifting. Again, these small weight and functionality improvements are cumulative and can shave important seconds over a long and gruelling event. When it comes to power meters the newly released Garmin Vector 3 and Vector 3S have improved from the previous Vector 2 and all previous complications seem to have been eradicated. The pedals are simple to install and transfer, extremely light and easy to use, and feature simple to replace batteries. They can hold a rider up to 105 kg’s and can use both bluetooth and Ant+. They are the best, most reliable power meters currently on the market.